The test is composed of three projects: a library, which imlpements a divide and conquer delaunay triangulation algorithm, and two tests to check its correctness. 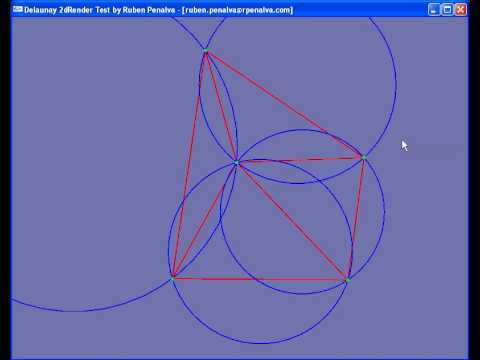 One of the tests is an opengl application showing the triangulation (watch the video). The development of the algorithm is based on the quad edge structure proposed by Guibas and Stolfi. It’s easy to implement because the paper is very well explained and it has a pseudocode of the algorithm. I recommend skipping part three of the paper if you don’t want to see the mathematical details. The difficult part of the development was to get a representation of the quad-edge structure in C++. “Primitives for the manipulation of general subdivisions and the computation of Voronoi” by Guibas and Stolfi. This entry was posted on Wednesday, May 20th, 2009 at 12:30	and is filed under Codepixel, Tests. You can follow any responses to this entry through the RSS 2.0 feed. Both comments and pings are currently closed. Can I used it for reading my 3d Points , and How ?